As if last year’s Javier Vazquez trade wasn’t bad enough for the Yankees, now comes word that Arodys Vizcaino, the young right hander sent to Atlanta in the deal, has been throwing lights out in spring training. In fact, in his last outing on March 9, Braves’ GM Fran Wren confirmed that at least two radar guns had the 20-year old Dominican right hander topping out at 101 mph. In an earlier spring outing, Vizcaino sat comfortably at 94-97 mph, so, needless to say, it appears as if he has fully recovered from the partial elbow tear that ended his 2010 minor league season. Will the Yankees’ regret trading Arodys Vizcaino? 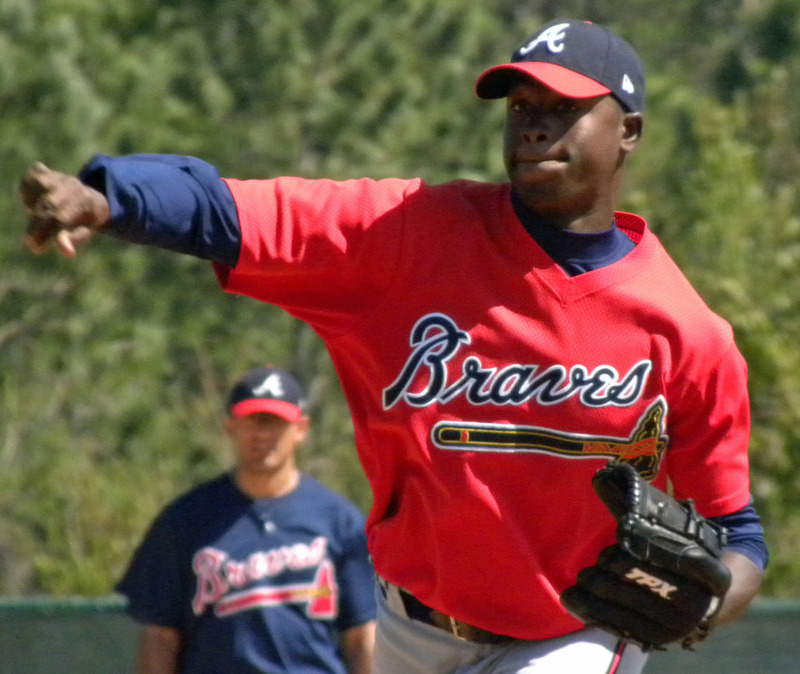 Vizcaino, who was considered a top prospect before his elbow injury, was among the Braves first spring cuts yesterday. Also assigned to the Braves’ minor league camp were Julio Teheran, Randall Delgado and Brett Oberholtzer, three more highly touted pitching prospects that provide Atlanta with enviable depth to complement its talented major league roster. In many ways, the Braves farm system is like the Yankees. Andrew Brackman, Manny Banuelos and Dellin Betances have all attracted a lot of attention in Tampa this spring, but you can’t blame Brian Cashman if part of his focus remains with Vizcaino. As the old saying goes, you can never have too much pitching, a philosophy that also applies to prospects. When the Yankees made the trade for Vazquez, many people focused on the departure of Melky Cabrera, but those more familiar with Vizcaino correctly identified him as the centerpiece of the deal. After all, it’s not like he was flying under the radar. Baseball America listed Vizcaino as the Yankees’ third best prospect, so Cashman had to know what he was giving up when he made the trade. Unfortunately, Vazquez had an absolutely miserable season in his return to New York. Despite his historically poor performance, however, two things prevented the deal from feeling like an absolute bust. One was the solid 40 innings of relief from Boone Logan, who was also acquired in the trade, and the other an elbow injury sustained by Vizcaino during the summer. Although no one would really wish ill health upon a player to mollify the fallout from a bad trade, the fact remains that with the young right hander’s elbow fully recovered, the chances of the deal coming back to haunt the Yankees have increased considerably. For all we know, Arodys Vizcaino could wind up being a minor league washout. What’s more, the supplemental draft pick the Yankees received when Vazquez left via free agency could yield a future Hall of Famer. In the meantime, however, hearing about Vizcaino’s impressive resurgence will likely grate on Brian Cashman, not to mention the team’s many fans who have made prospect watching a new pastime. After missing almost two weeks of action with a groin injury, Andrew Brackman finally made his spring debut for the Yankees in yesterday’s exhibition game against the Braves. Even before the setback, it was going to be a tall order for the young right hander to head north with the club, but his eventual promotion seems to be less about if and more about when and in what role. When Brackman finally does get the call, history will be waiting for him, and all he’ll need to do is throw one pitch. At 6’ 11”, Brackman would not only become the tallest Yankees’ pitcher of all time, but he would join the Blue Jays’ Jon Rauch as the tallest player in major league history. Of course, to accomplish that feat, Brackman will have to beat Loek Van Mil to the majors. At 7’ 1”, Van Mil would blow away the competition, but considering his 6.37 ERA with the Twins’ double-A affiliate last year, he isn’t likely to make the major leagues. If Brackman does join Rauch as the tallest pitcher in baseball history, he’ll become only the second Yankee to hold that distinction. 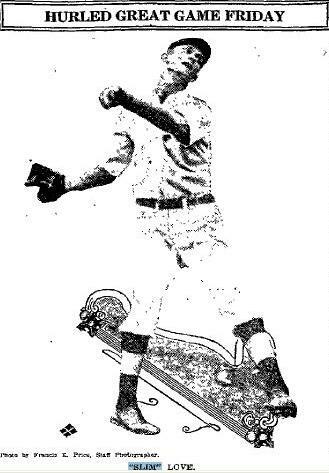 The first was a 6’ 7” lefthander named Edward Haughton Love, but better known as Slim. *Tallest in major league history to date. Slim Love was born in, where else, Love, Mississippi on August 1, 1890. Otherwise, little is known about the early life of the tall and lanky southpaw. In fact, it seems as if he just dropped out of the sky onto the baseball landscape. Considering his height, Love would have been a perfect bridge between the two. Maybe it isn’t a stretch to suggest he just materialized out of thin air? Unlike most major leaguers, Love wasn’t a highly sought after prospect uncovered by a scout beating the bushes. He wasn’t even a journeyman who first opened eyes pitching for a local squad. If Love was playing baseball somewhere as a youth, no one knew anything about it, and considering his abnormal height, he would have been hard to miss. According to an account in The Washington Post, Love’s baseball career evolved from his own barroom bragging. As the story goes, Love, who had traveled up from his hometown to Memphis, Tennessee, walked into a local watering hole, took a seat at the bar, and ordered everyone a drink. Then, the affable giant boasted about his prowess on the mound and boldly claimed that he had come to Memphis with the sole purpose of leading the town’s ballclub to the pennant. Although Slim wasn’t the first guy to walk into a bar and start spinning yarns, he must have been very convincing. Impressed by both his confident demeanor and commanding size, the proprietor of the tavern reached out to Bill Bernhard, a friend who also happened to be the manager of the Memphis Turtles (known as the Chickasaws starting in 1912). In no time, the lanky lefty found himself working out with the Memphis team, and soon thereafter was given the chance to prove that he was more than just a fast talker. One of the cardinal rules about spring training is you have to take the results with a grain of salt, especially the early performances of eager rookies who are either facing veterans slowly ramping up to speed or overmatched secondary talent. With that disclaimer noted, some of the bad vibes from the Yankees’ offseason of discontent dissipated yesterday thanks to impressive early performances from three of the team’s young prospects. 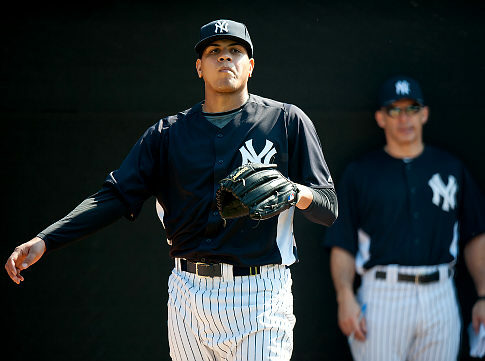 Can Dellin Betances continue to make Joe Girardi take notice (Photo: Daily News)? The biggest impression from the spring contest against the Phillies was appropriately left by imposing 6’8” right hander Dellin Betances, who struck out the side in his one inning of work. More impressive than the result, however, was the way the Brooklyn-born hurler achieved it. In addition to featuring a mid-90s fastball (that topped out at 97), Betances also wielded a late breaking knuckle curve that had several Phillies’ batters fooled completely. After striking out Wilson Valdez to end the inning, YES cut to a shot of Joe Girardi and Larry Rothschild practically leaping to their feet. Could one performance alter the Yankees’ stated intention to have Betances start the season in the minors? During Betances’ inning of work, there was a very lively discussion in the YES booth. Jack Curry stated that the Yankees were very reticent to bring Betances north, but the door was slowly opening. After yesterday’s performance, you can officially consider it ajar. As Michael Kay noted, however, even if Betances does make the team, he’s likely to face an innings limit of around 120 innings, or about 20 starts. Although that might not seem like a great option, the best solution might be the one suggested by Ken Singleton: give Bartolo Colon or Freddy Garcia a chance to fail and then use Betances as a mid-season replacement, just like the Yankees did with Chien-Ming Wang in 2005. Of course, in order to do that, the Yankees will need to limit Betances’ innings in the minors. Considering the likelihood that the Yankees will need midseason rotation help, and Betances’ ability to provide it, wasting valuable bullets in the minors would be shortsighted. Chuck Tanner’s place in baseball history will forever be as the patriarch of the 1979 “We Are Family” Pittsburgh Pirates, who overcame a 3-1 deficit in the World Series to upset Earl Weaver’s Baltimore Orioles. However, it doesn’t seem fair to boil down an over 50-year baseball career to just one moment. Tanner’s baseball journey began as a 16-year old prospect when he was signed by the Boston Braves in 1946. After nine long seasons in the minors, he finally made his major league debut in 1955 for the now Milwaukee Braves. Apparently, not wanting to make a return trip to the bushes, Tanner didn’t waste any time in his first at bat, a pinch hit appearance for the great Warren Spahn in the eighth inning of the Braves’ opener on April 12. With his team trailing 2-1, Tanner swung at the first pitch from the Reds’ Gerry Staley and sent it sailing into the grandstand for a game tying homerun. The Braves tacked on two more runs in the eighth and then held on to the win, but the story after the game was Tanner’s dramatic blast, which at the time made him only the seventh player to hit a round tripper on the first pitch faced in the majors. Tanner was right, at least with regard to his playing career. Although the newspapers had fun portraying the blast as a “rags to riches” story, the journeyman minor leaguer would really never make much more of an impact as a player. Over the next eight seasons, the outfielder bounced around the league as well as back and forth between the minors and the majors before finally retiring in 1962 as a member of the Los Angeles Angels. Although he didn’t really make much of an impression as a player, Tanner did build a reputation as a smart baseball man. So, when his playing days were over, the Angels hired him to manage their Quad Cities affiliate in the Midwest League. After spending parts of 14 seasons in the minors as a player, Tanner embarked on another long journey in the minors as he gradually managed his way up through the Angels’ farm system. 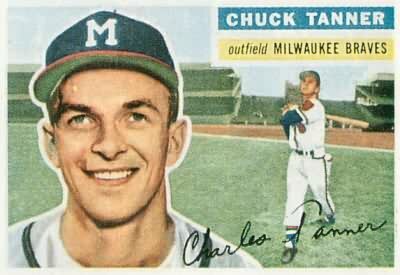 Following a stint in Quad Cities, Tanner moved on to the El Paso Sun Kings (Texas League), the Seattle Angels (Pacific Coast League), back to El Paso, and then finally to the Hawaii Islanders (PCL). Update: Minutes after this post was published, Law also released his top-100 prospect rankings. Angels’ outfield prospect Mike Trout topped the list, just ahead of 2010 draft wunderkind Bryce Harper and the Phillies’ Domonic Brown. As for the Yankees, Jesus Montero ranked highest on the list at number four. According to Law, Montero’s ability to hit is without question (he invoked Frank Thomas as a comparison), but concerns about his defense as well as the durability of catchers his size remain. Also appearing in the top-100 were four other Yankees, most notably Manny Banuelos, who not only ranked 12th overall, but also fourth among pitchers. Despite his young age, Law stated that his advanced physical development means Banuelos isn’t far from helping the big league club. Perhaps, he will be the Yankees mystery fifth starter by midseason? Also ranked in the top 100 were Gary Sanchez (68), Dellin Betances (73) and Andrew Brackman (88), while Austin Romine just missed the cut. Rounding out Law’s list of the Yankees’ top-10 prospects were Graham Stoneburner, Slade Heathcott, Hector Noesi and Adam Warren. Keith Law’s latest MLB organization rankings have been posted at ESPN.com, and the Yankees find themselves inside the top-10. Law singled out the team’s catching depth, which includes Jesus Montero, Gary Sanchez and Austine Romine. Law was also impressed with the development of Dellin Betances and Andrew Brackman, both of whom made significant strides in their recovery from injury. Also mentioned were Manny Banuelos as well as a mystery player selected toward the end of last year’s draft. On Friday, Law intends to publish a profile on that player, so all readers with an ESPN insider account should mark it on their calendars. 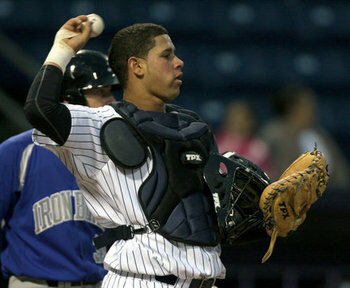 Most Yankees fans are familiar with Jesus Montero, but fellow catching prospect Gary Sanchez is not that far behind. Law’s high opinion of the Yankees’ farm system echoed Jonathan Mayo’s prospect rankings, which were unveiled at MLB.com on Tuesday. The Yankees placed three prospects –Montero (9), Sanchez (32) and Banuelos (35) – on Mayo’s list of the game’s top-50 prospects, while Betances just missed the cut at 53. Like Law, Mayo also rated the Royals (six prospects) and Rays (four prospects) highly. On the other end of the spectrum, the Mets, Marlins, Brewers and A’s were the only four teams not represented. Law’s and Mayo’s findings validate Brian Cashman’s strategy of paying almost as much attention to the minors as the major league roster. Even as the Yankees have been able to maintain a championship caliber team, Cashman has simultaneously gone about rebuilding and then fortifying the team’s farm system, which is why the general manager was so reticent to surrender a first round draft pick with the signing of Rafael Soriano. The strength of the farm also provides insight into why Cashman has been so patient this offseason. As Steve S. at TYU noted in his excellent recap of Cashman’s WFAN breakfast chat, the Yankees’ general manager believes Banuelos and Betances both have “Phil Hughes or better ceilings”, and all levels of the minors will feature legitimate prospects in their respective rotations. Cashman even relayed Gene Michael’s belief that David Phelps and Adam Warren could be better than Ivan Nova. Although Mayo’s list is available in its entirety at MLB, Law’s work (which is probably the most exhaustive and informative in the field) remains behind ESPN’s pay wall. So, listed below is a brief and select summary of his conclusions.